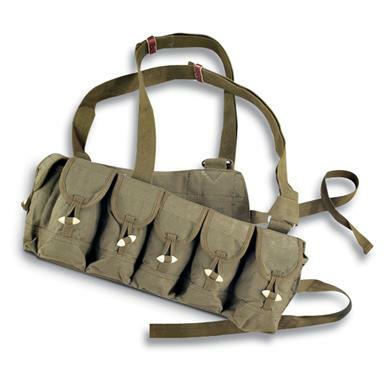 Chinese Military-issue SKS 10-pocket Bandolier, O.D. Chinese Military - issue SKS 10 - pocket Bandolier. All the ammo you need, strapped to your chest and within easy reach. Adjustable canvas web shoulder straps. Condition: brand new, never issued. Get ready for a big day of shooting! A layer of warmth and style. Runs Bigaria-label="A rating of 1 means too small, a rating of 5 means too big, a rating of 3 means true to size. This items average rating is 2.0. Quality carry for your collectible firearm. Extends from 47" to 63"
Help carry a heavy load with this weapons sling.